The pastries, breads and pastas of the oldest bakery in Bologna make a perfect take-home gift from a city known for culinary treasures and traditions. The window displays at Paolo Atti & Figli are hard to resist. But if you aren’t into window-shopping, you’ll likely succumb to the sweet aromas of freshly baked pastries wafting onto the street. I was doomed on both accounts. And in case you haven’t yet had the pleasure of eating an Italian bombolone (singular for bomboloni), it’s a yeasty, calorific donut filled with cream, chocolate or other fillings that puts Krispy Kreme and Tim Hortons to shame. Yes, it tastes that good. But that was just the beginning. A changing cast of tempting cookies, pastries, pies—and more, appeared in the windows each morning. Then, with the help of a tour guide, we discovered the mother lode. She was showing us around the old market area of Bologna, called the Quadrilateral. Around the corner from the smaller Atti shop we had been frequenting she introduced us to the big Atti shop, an elegant shop on Via Caprarie, where chandeliers, frescoed ceilings, and art nouveau furnishings are as likely to catch your eye as the yummy breads, pastries and pastas. The two shops share a common kitchen. At either one, visitors with a sweet tooth will feel as if they have reached nirvana. 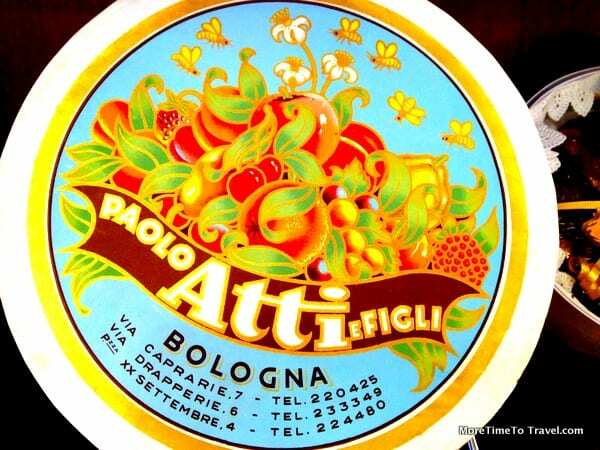 Founded in 1880, Paolo Atti & Figli has a lengthy backstory spanning five generations of the same family. A lovely little book by Beatrice Spagnoli (a journalist born and living in Bologna) traces the history of the shop and documents the inspiring recipes she gathered from frayed family notebooks. The Spagnoli book is sold in the shop. In brief: More than 120 years ago, Paolo Atti and his wife Adele founded the company, living atop the bakery and using its basement to store coal and flour. The business was extremely successful and eventually joined forces with the prestigious Zambelli Pasta Company. During World War II, however, Bologna faced extraordinary challenges during the time of German occupation. As bakers, Casa Atti had to contend with huge shortages of white flour, and were also forced to provide food to armed soldiers while they hid partisans in the basement. In 1944, an allied bomb devastated the building where they were located, causing the shop to be closed for more than a year. Generation after generation, the recipes of Casa Atti were faithfully handed down from mother to daughter. The current shop owner, Anna Maria Bonaga, and her daughters still follow the cooking traditions of Nonna Margherita and Mamma Paola. Since 1956, Anna Maria has been married to Romano Banoga, another legendary culinary figure in Bologna. Romano is a descendent of the Tamburini family who owns the famous salumeria on the corner between the two Atti shops. The formula for success among the Atti family rests on the quality of their products, their entrepreneurial acumen, and their modern approach to marketing. The popular packaging used for cakes and pasta today relies on the same attractive art nouveau designs and lettering that attracted customers a century ago. Cristina told us that many Bolognese bring the beautifully boxed products as house gifts when visiting friends. Paolo Atti & Figli has earned the distinction of being one of only four places in Bologna listed by the Association of Historical Places of Italy, a non-profit group that selectively recognizes the oldest hotels, restaurants, cafes and products of historic importance. This post is part of a Linkup to Noel Morata’s Towers of Bologna. Wow. Those bakery treats look scrumptious. It was interesting to read the history of Paolo Atti & Figli. I’m glad you found the history interesting. I did too! There are so many temptations that it’s hard to cover all the bases! Bakeries are my downfall and the second photo of the bombolini had me salivating. Hats off to these families that manage to hand a business down through the generations. It would be interesting to see what changes if any they have made to the recipes over the years. It seems like they have added new products but have done a great job of preserving traditions. there is nothing more intoxicating than the fragrance of a bakery. I couldn’t resist the bomobolone, looks wonderful. I’m off to google the packaging you mentioned.. This company appears to know its presentation, marketing, and product. That’s the recipe for longevity. What a great comment~ Yes, the combination of all these factors is positively irresistible! “Oggi bomboloni: La dieta domani” – a great motto! Paolo Atti & Figli looks like a tasty place to visit, and its history makes it even more appealing. You had me at P-A-S-T-R-I-E-S! I’m ashamed to admit that I have no stop button when it comes to baked goods and my mouth was watering as I ogled each one of your lovely pictures of the scrumptious goodies! I’ll have to agree with the motto “Today bomboloni: Diet tomorrow.” Life’s too short! It all looks so delicious! I enjoyed reading the history of the bakery; very interesting! Glad you found it interesting, Marilyn! I so love visiting bakeries when we travel. Bologna’s bakeries look marvelous. Now I have the urge to run to the nearest bakery after seeing your terrific photos. Thanks! Oh my these photos bring back memories of staring through all those bakery windows in Italy and trying to exercise self control. It must have been interesting learning about the history of a bakery that has been around a long time. I’m sure it’s a lot of work making those little works of art. OMG, would I like an Italian bombolon right now! Your images are mouth-wateringly delicious.